1. 5 players designated as servers on outside of 20x20 grid - rotated every 1 minute. Players start will moving round, finding server and performing inside of the foot volley on both feet before moving away. Players work for 2 minutes. Last 30 seconds just finding the servers for short passes and moving on. 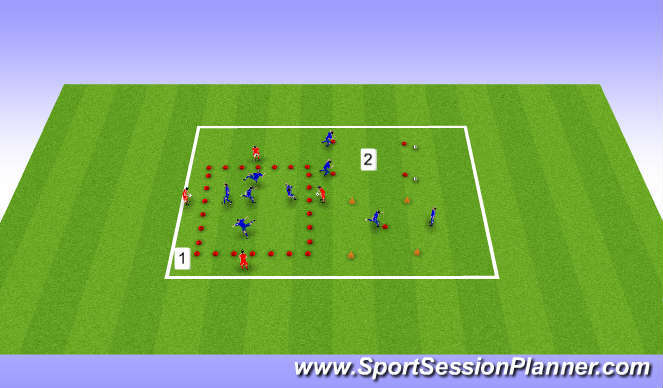 Players then perform their maximal falling starts and decelerate, players then travel back to start of line keeping the ball up, run the ball back to the end of the line as quick as possible, then walk back. 3 sets. 3. Quickness Dill -Players start in the middle cone in the athletic stance, partners calls out a cone players must eitheir sprint out to it and back pedal or backpedal then sprint back to starting position. Players repeat this ffor 10 seconds then partners swap over and repeat 3 times each.